Happy Last day of February and the Stampin Sale-a-bration is in full swing. You still have 31 more days to take advantage of the Sale-a-bration and earn free product from the Sale-a-bration catalog for every $50 spent in Stampin Up merchandise. 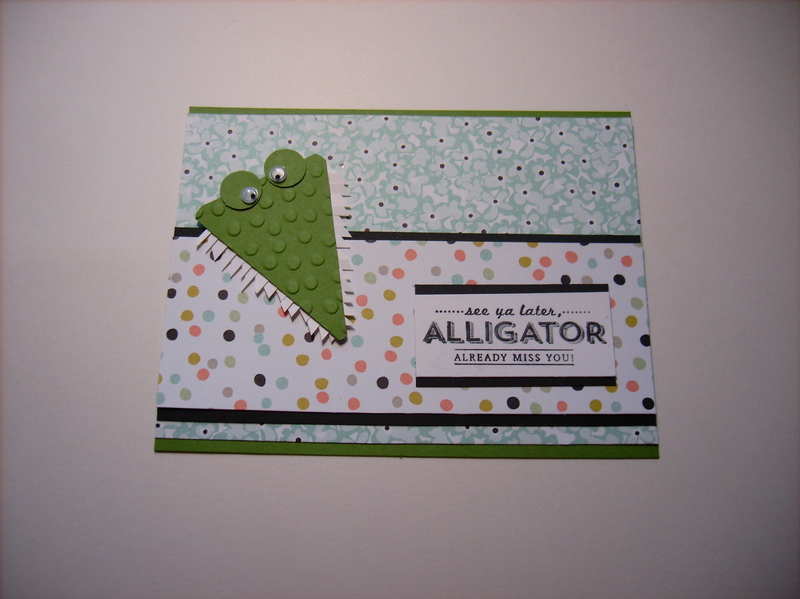 Today’s card is a super cute card Cammie made using some of the sale-a-bration products. Both the background DSP and the DSP strip are from the Sweet Sorbet #133521 DSP SAB collection. The sentiment is stamped from the See Ya Later #133533 stampset. To accent the sentiment, Cammie made an alligator from punch art. The face is punched from the Petite Pennants Builder punch#122361 and textured with the Decorative Dots (free SAB item) folder #133520. She used her fringe scissors 133325 to make the gnarly teeth. She added 2 eyes bunched from the Itty Bitty Shapes 3118309 and added the fun googly eyes. See ya later February and hopefully winter too. Today is another day for a birthday shout out this week. Today is our beautiful niece Alexandra’s 19th birthday. 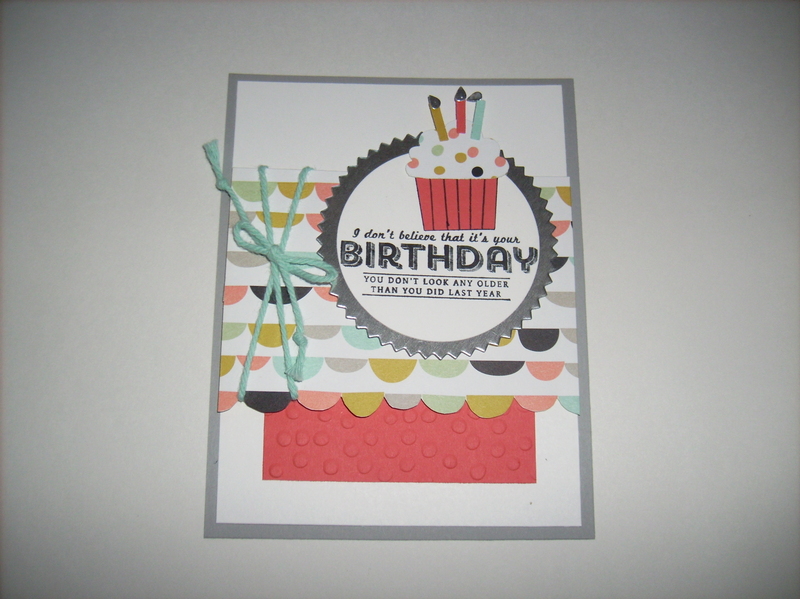 So what better to celebrate your birthday than with a cute card complete with a cupcake? 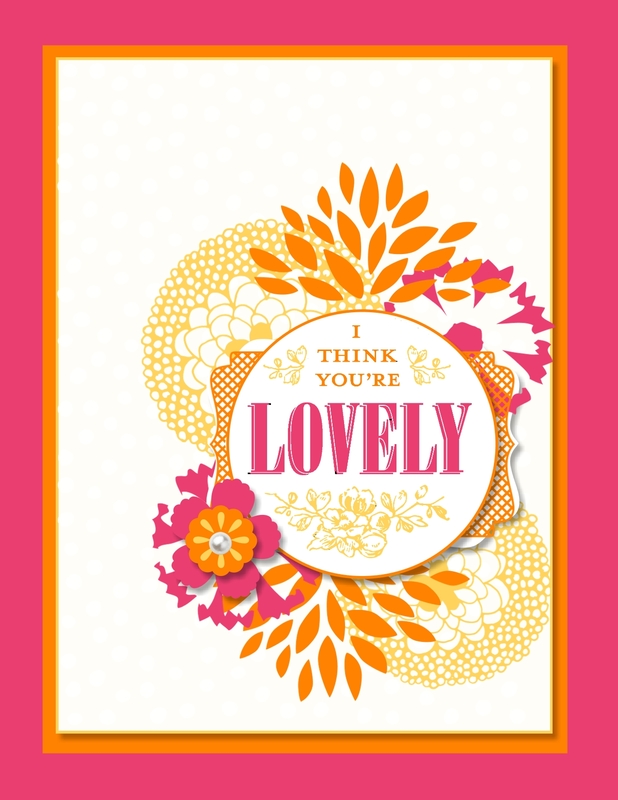 Cammie used a strip of Sweet Sorbet DSP (free SAB item) #133521 as the inspiration for this card. She hand cut the scalloped edge and placed that on top of a cantaloupe piece of cardstock textured with the Decorative Dots #133520 (free SAB item). The focal piece is the silver foil #132178 starburst cut using the Starburst framelit #132967 from the Stampin Up occasions catalog and then she cut a whisper white circle using the circle framelit #130911 and stamped the sentiment from the See Ya Later #133536 (free SAB item) stampset. Cammie punched and assembled the cupcake using the Stampin Up Cupcake Builder punch #121807 and finished the card with a Pool Party bow from the Twine in the Sweet Sorbet Accessory Pack (Free SAB item). A big birthday shout to our Brother -in-Law David for his birthday yesterday. It was digital download day so I failed to mention his birthday. Oh well I hope his birthday was a happy one. I really struggle with making masculine cards and when I saw this fun Fresh Prints DSP Paper pack in the Stampin Up occasions catalog, I knew that I would use this for some masculine type cards. David and our baby sister Blair bird feeders and watching the birds from their deck so I made a birdhouse using the Stampin Up Hexagon Punch #130919, 1 1/4 ” square punch, and the small heart #117913. I added a piece of real red 1/4 ” stitched ribbon. The bird house is mount on a piece of coastal cabana cardstock textured with the Decorative Dots (free SAB item) texured embossing folder from the Stampin Up Sale-a-Bration catalog. I finished the card with a sentiment from a retired stampset (sorry I can’t remember the name). 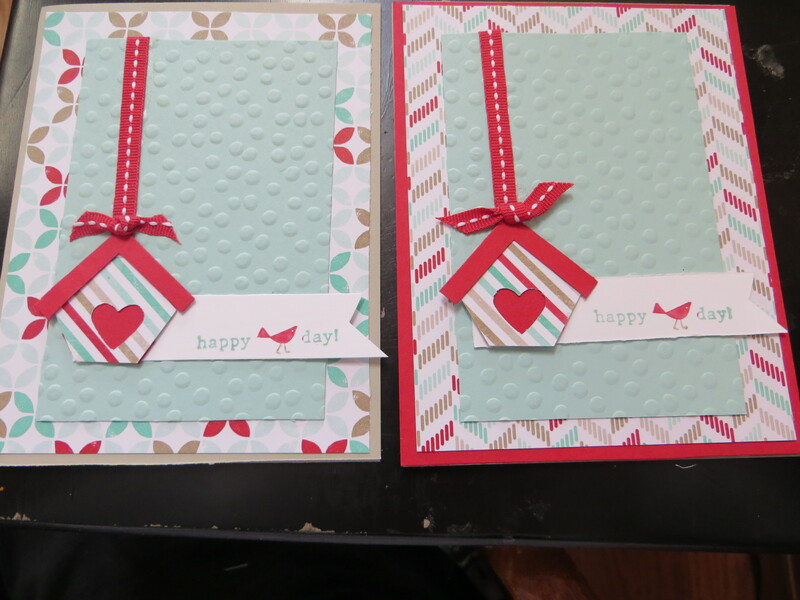 I made the card the same way and featured 2 different background papers from the Fresh Prints paper stack. Happy Birthday to our sweet friend Julie Hahn! 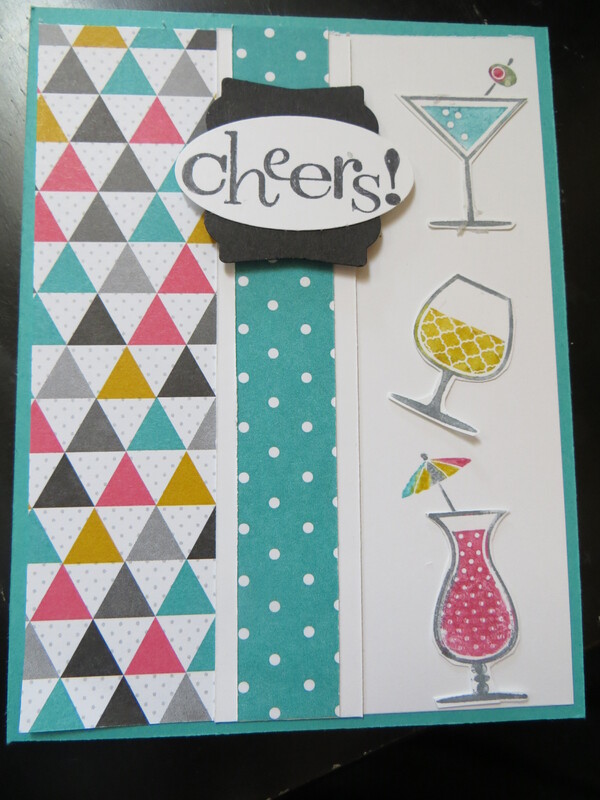 We spend time every summer with the Hahn family on Austin Lake sipping cocktails so I thought it would be fun to add some bright and cheery fun to this winter by making Julie a card using the Kaleidoscope DSP from the Stampin Up occasions catalog and pairing it with Happy Hour #126642 stampset from the Stampin Up annual catalog. Each cocktail is meticulously hand cut and place along the white panel. I added the cheers sentiment in an oval and matted on the artistic label #130920. It’s 5 o’clock somewhere Julie so Cheers to you! First of all we need to give a birthday shout out to my high school classmate and dear family friend, Belinda. 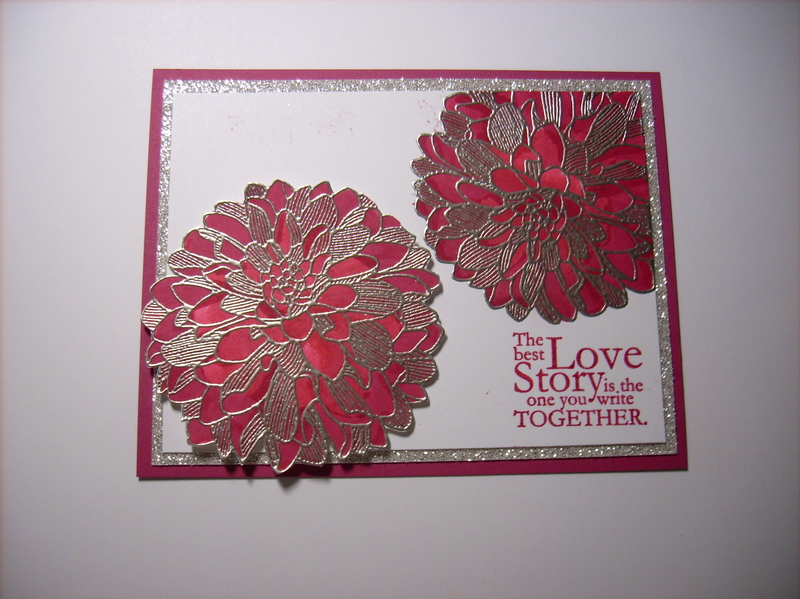 Today’s card is a simple layout featuring the Regarding Dahlias #130327 stampset and is packed with a whole lotta punch! Cammie embossed each flower in silver embossing powder and then hand cut each flower before placing them on the white panel. The sentiment is from the One in a Million #126382 stampset and the card is double matted with a shiny silver glimmer #124005 mat and a melon mambo mat to create a beautiful wedding card. 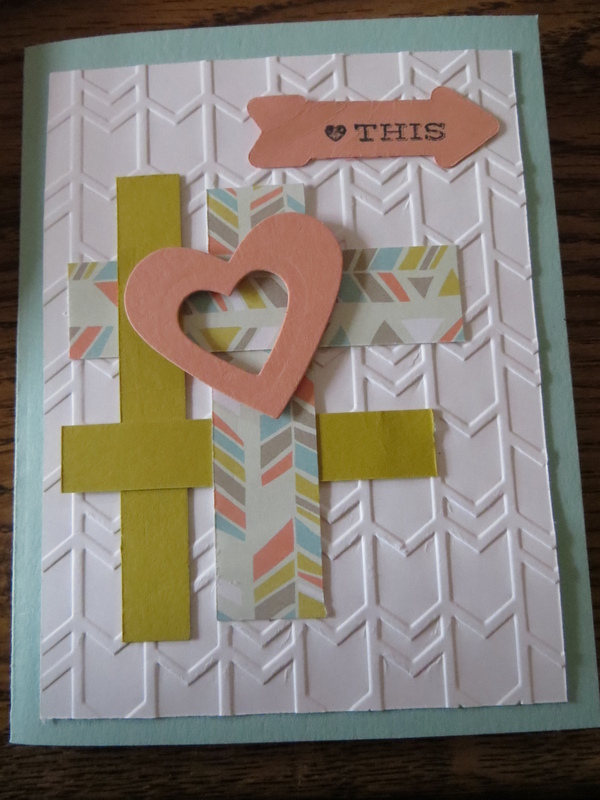 I have been creating a lot of cards lately using the free Sweet Sorbet DSP from the Stampin Up Sale-a-bration catalog and that means there are a lot of scraps. So this card is one I made from all scraps. I textured the background using the Arrows textured impressions embossing folder #132187. I then used scraps to create the grid. I used the Heart framelits #125599 to create the heart in heart accent piece. The arrow was cut using the On Film framelits #132969 and stamped the sentiment from the Hip Notes #133504 from the Stampin Up occasions catalog. I always feel good using up some scraps that normally would never be saved when I clean up my work surface. This is truly a trash to treasures type of card!